The 900SS is simply the best street bike Ducati has ever built. 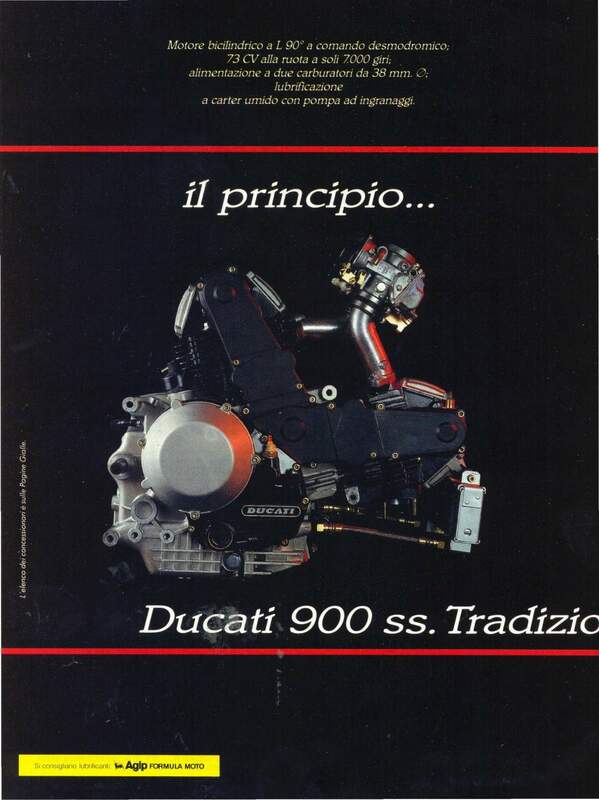 That's a provocative statement, considering the competence of Ducati's other recent releases, the 907 I.E. 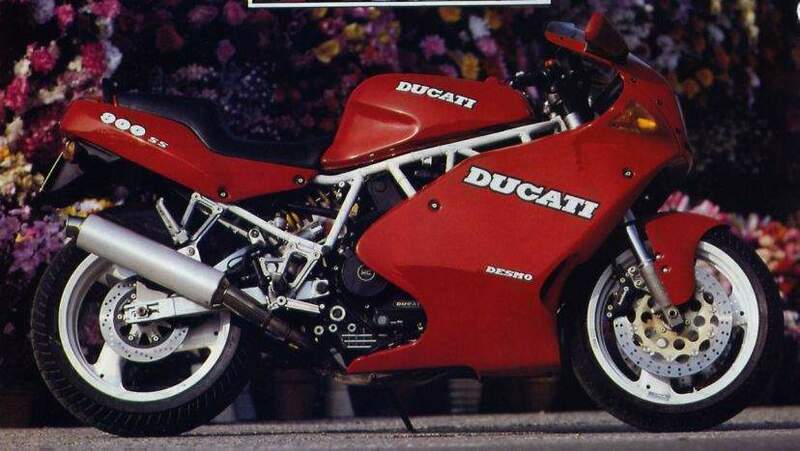 and the 851 Superbike, It's even more surprising when you consider the 900SS isn't all-new, and borrows many bits and pieces from other Ducatis. It doesn't even use the firm's latest technology, such as four-valve heads. liquid-cooling, or fuel-injection. As with all great machines, it's the right combination that counts, one that Ducati has taken nearly a decade to unlock with the 900SS. Despite its designation, the 900SS has little in common with the original 900 Super Sport of the late seventies, with its towershaft-and-bcvel-gear-driven cams and twin shocks. The lineage of the '91 900SS traces back to the early eighties, to the 600cc TT2 Ducati built for Formula 2 competition in Europe. Based around an enlarged, two-valve 500 Pantah engine with belt-driven cams, the TT2 relied on a lightweight, minimalist frame largely made up of straight chrome-moly tubes, with the solidly mounted engine completing the structure. A triangulated swing arm worked a can-tilevered rear shock, with no rising-rate linkage—much like Yamaha's early monoshock designs. 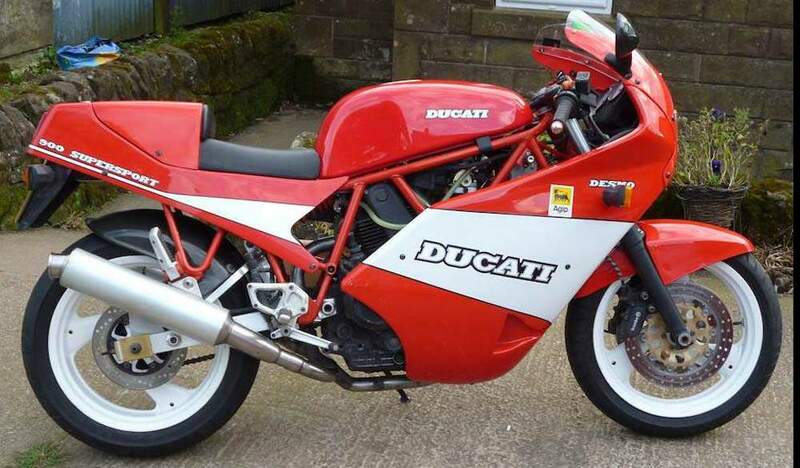 The same basic elements were found in the street-going 750 Fl of the mid-eighties and the second-generation 900 Supersport introduced for 1990 (see "Hits" September 1989 and February 1990). 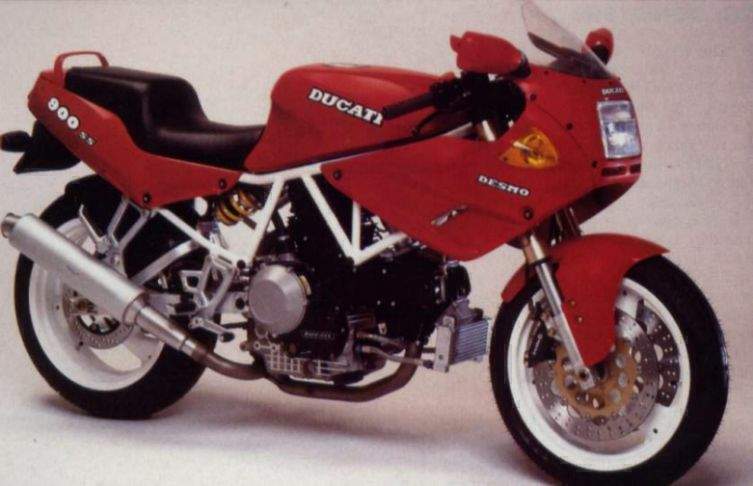 While Europe and Japan got the new 900SS, America received a revised Fl called the 750 Sport (see February 1990). The 900 and the 750 shared frames, bodywork, sundry items, and the glitch-troubled Weber 44 DCNF automotive-style carburetor. The 750 used an air-and-oil-cooled, two-valve engine with a five-speed; the 900 ran an air-and-oil-fooled powerplant that shared its six-speed bottom-end with the liquid-cooled 906 Paso. 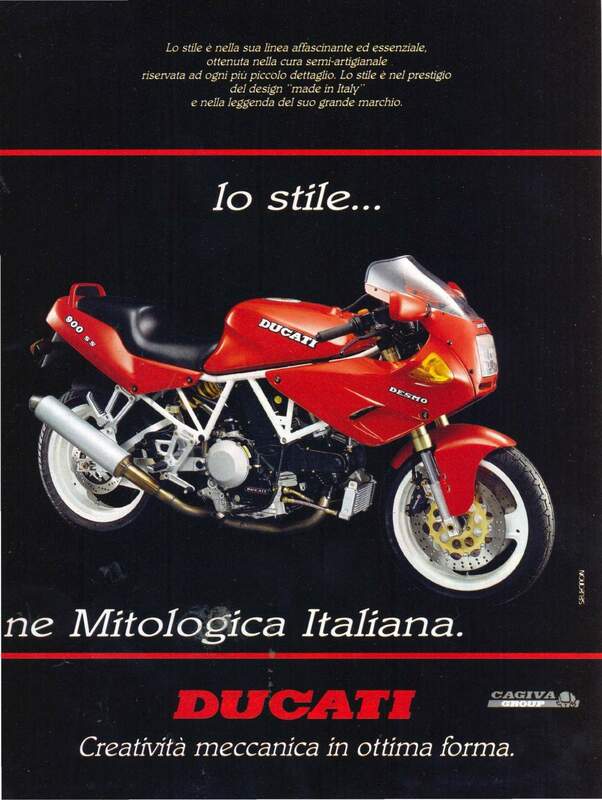 For '91, Ducati offers the 900SS to U.S. riders—but a vastly different version from the one sold in Europe last year. Making changes with a swiftness previously reserved for Japanese firms, Ducati overhauled the 900SS, much as it did when creating the 907 LE. from the 906 Paso—which also saw only one year of production. Back again is the 90-degree Y-twin, which—as with the liquid-cooled 907 I.E.—displaces 904cc, via a 92mm bore and 68mm stroke, boasts a 9.2:1 compression ratio, and breathes through two valves per cylinder. As in the past, each of the desmodromically actuated valves relics oil paired rocker arms to open and close, not conventional valve springs. Unlike the 907 I.E, the SS keeps ternperatures and complexity—down by circulating lubricant between the bore liners and the cylinder castings, and boosting oil flow to the heads. Aside from major engine components, Ducati manufactures little for its own motorcycles, sourcing most parts from vendors. This allows the Bologna firm to make dramatic, rapid changes simply by checking off new items on its suppliers' shopping lists. And with restrictive Italian trade banners crumbling, Ducati is free to shop outside the country for the best hardware. Nowhere was this new freedom more beneficial than in getting rid of the troublesome Weber carb. Instead of replacing it with the 907's electronic fuel injection, though. Ducati bolted on a set of equal-length intake traits—a first for carbureted Ducatis— and topped them with :58mm downdraft C carbs from Mikuni. The results are impressive, on the drag strip and on the street. Other than the 1989 and 1990 851s, the booming 900SS is the fastest street-legal twin Cycle has ever tested, and not far off the standards set by Japanese 750 fours. Through the quarter-mile, the 900SS clocked an outstanding 1 1.64-second run, exactly one-tenth quicker than the 907 and one-tenth slower than the fuel-injected, eight-valve. In 45-to-70-mph roll-ons, the 900SS whips both its fuel-injected stablemates in the top three gears. In sixth-gear roll-ons, the SS accelerates harder than six-speed literbikes such as Hondas CBR and Kawasaki's King Kong ZX-11. In fifth, the SS also leaves behind an) of the open-class' five-speeders, including Yamaha's FZR 1000) and FJ1200. Much of the Ducati's speed can be attributed to its power-to-weight ratio. At 140.5 pounds it's lighter than any Japanese. 600cc sport bike, and .16.5 pounds less than the original kickstart, wire-spoked 900 Super Sport. But the dyno performance of the 900SS comes close to that of its fuel-injected brethren. With 64.7 peak horsepower at 7000 rpm. That's only 5.3 horsepower shy of the 907's figure and 11 ponies away from the 851. Better yet, Ducati didn't extract horsepower from the SS at the expense of everyday civility. There's no more of the Weber's off-idle flat spots, stumbles and cable friction 'hat hampered the 750 Sport we last tested. While not quite as crisp as the fuel-injected 907. the 900SS starts willingly, idles happily, and chugs along at 2500 rpm in top gear, its light throttle a far cry from the wrist-crampers of Ducati s past. The 900's responsiveness makes it a willing partner, one that's easy to manage even on unfamiliar backroads. What's more, the Ducati accomplishes the remarkable roll-ons with extremely tall gearing. While it has the same internal ratios and countershaft sprocket as the 907, the SS has three fewer teeth on the rear cog to keep revs clown and help it slip past noise-emission standards a foal made tougher for the SS by its air-cooling, a more open fairing (which can't deaden sound as effectively as the 907's full enclosure), and less-restrictive mufflers. With its 37-toolh rear sprocket, the SS is geared so tall that legal freeway speeds have the engine limping along unpleasantly and throbbing uncomfortably in top gear. In the interest of science and even easier wheelies, we installed a 39-tooth rear sprocket, which not only made the Ducati happier in town and smoother on the freeway (turning a soothing 4000 rpm at an indicated 70 mph), hut improved its roll-ons even more, slicing some 0.3 second off its sixth-gear time. The SS carries its engine in a revised and strengthened 750 Sport frame. Additional stets brace the main down-tubes just above the engine, and the rear subframe replaces the 750's integrated footpeg and muffler hangers with bolt-on. aluminum pieces. Italy's Brembo supplies the brakes, including huge, 320mm floating discs up front with four-piston calipers, identical to those on the 851. Ducati again took advantage of Japanese suppliers, fitting a Showa fork and shock, instead of the traditional Marzocchi. The 900's 11 mm male-slider fork (shorter than the "90 model's) closely resembles that on the 851. and the shock boasts a piggyback reservoir; both ends feature adjustments for spring preload, compression and rebound damping. 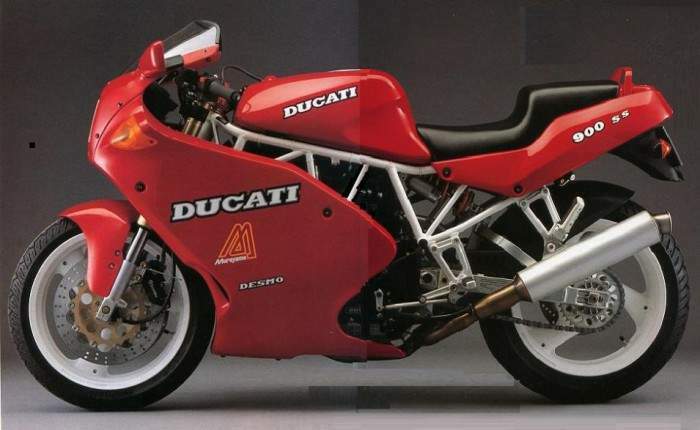 Most importantly, Ducati dramatically improved the new bike's handling over 1990's heavy-steering 750 Sport and 900SS. Both bikes came with overly generous trail and an old fork rake of 28 degrees, which overworked riders during fast backroad hustling. On the 750. a superwide, 3.75-inch front rim also contributed to truckish steering. Last year's 900 mounted up-to-date 17-inch wheels, 5.5 inches wide in back and a slimmer 3.5 inches up front to reduce steering effort. But it was burdened by 5 inches of trail—25 to 30 percent more than Japanese sport bikes with similar tires and missions. Down the straights, it was as stable as a cruise ship, but about as willing to turn quickly entering corners. To counter that for 91, Ducati tweaked key chassis numbers while making few major, expensive changes. Installing a revised aluminum swing arm with longer axle slots, the new 900's wheelhase was reduced 0.5 inch to 55.5 inches, the shortest of all Ducatis. That swing arm attaches to a shock 0.5-inch longer, raising the rear arm working with the new, shorter fork to luck I he steering head in from a Ducali traditional 28 degrees to 25. The reduced rake and new triple-clamps chop trail from 5 inches on last year's 900SS to 4.1 inches, only slightly more than the racer-replica 851 Superbike, and—finally—solve the geometry equation. The 900's new chassis numbers amount to much more than impressive figures on a specification sheet. In its natural element, a curvy mountain road, the 900SS is, as one tester put it, "absolutely wonderful ... one of the five best-handling bikes I've ever ridden." This motorcycle seems anxious to do whatever you ask, whether it's braking hard into a corner, clicking hard over, changing lines in millrun, or blasting out down the straight. The suspension contributes mightily to this newfound competence, offering a laud ride, and keeping the chassis neutral, reassuringly stable and well-planted. Our hard-riding, 140-pound expert preferred the fork with four and a half marking rings showing on the preload adjuster, and compression damping live clicks (of 14) from full hard. He liked the shock's compression damping a quarter turn away from full hard, and spring length set at 166mm. Set up this way, he fell the 900 was slightly stiff for general street riding and slightly soil for all-out backroad blitzing in other words, an excellent day-to-day\ compromise. The rest of us favored softer set, with Eve and a half rings showing on the fork's preload adjuster, its compression on the 10th position. We set the shock's spring length at 169inm and, looking to reduce some of the bike's harshness over sharp humps, softened compression damping all the way and wished we could lighten it up even more. While it changes direction rapidly, the Ducati asks for a medium level of rider effort to turn. Remarkably light and tiny for a 900cc machine, the Duck steers more like a 900 than the average 750, slightly heavier than the light-steering Honda CBR600. The 851 Superbike may be faster, but on a backroad the SuperSport is easier and more pleasant to ride, offering linear, predictable handling that's accessible oven if you don't have Doug Polen's abilities. The racer-like 851 demands an expert—or someone who intimately knows the road—to flick it decisively into corners; it wants little time to be wasted on the transition from straight-ahead to full lean. Not the SS; it responds as predictably and confidently to the slower and less-certain demands of novices as to the precision of experts. Over choppy mountain passes the 900's softer suspension doesn't pound you as much as the 851"s, and the 900 has higher clip-on handlebars than the Superbike, helping lighten turning chores. Flicking left and right is also made easier on the 000 because of its 42-pound weight advantage over the 851. On those same backroads, the 72-pound-heavier 007 I.E. cant compare; the tiny SS makes the 907 feel big, tall, wide, and unwilling. The 900 doesn't beat you or wrestle with you, it dances with you. When banked over, generous cornering clearance on the narrow 900 keeps hard parts off the ground; nothing touches on either side. The front brake requires only moderate effort, and while slightly mushy-feeling, offers good feedback on front-wheel traction. After pushing hard, though, the front brake fades badly, allowing the lever to come back to the bar. Blaine this in part on overly flexible hydraulic lines that balloon with heat; steel-braiced lines are called for. But the rubber on the rims is the Ducati's weakest spot. The A59X/M59X Michelins stick well initially, but become greasy when hot. and lose traction unpredictably, even under steady throttle over good asphalt. Minor harshness of the suspension and lackluster tires are the only major chinks in the Ducati's backroad armor. The healthy engine produces power accessible for any corner, the transmission shifts slickly, and the clutch pulls with low effort. The chassis combines superb stability and agility; the overall result is a motorcycle that makes going last easier than you ever thought possible. Realize, though, that the Ducati's way of gathering steam may not be for every taste. The 900 builds serious power low, lunging forward before 5000 rpm and shutting down early, near 8000 rpm—a point where many Japanese fours haven't even started producing real power. Riders accustomed to the top-end rush of 13,000-rpm inline-fours may not enjoy the short-shifting called for by the Ducati. Even high-rev vibration differs on the Italian V-twin: forget about a four-cylinder's electric, high-frequency buzz; from 6500 rpm on, the Duck pummels your hands and feel with jackhammer throbbing. The original Super Sport was renowned for being especially stiff, harsh, and uncomfortable. Its nineties reincarnation, however, ranks as one of the more pleasant current sport bikes, thanks to a flat, supportive seat, adequate legroom, and reasonably high clip-ons matched with a short saddle-to-bar distance that doesn't ask its rider to crouch over too far. Not quite as roomy, plush or accommodating as the 907 I.E., the 900SS still suits riders of various sizes. Smaller ones fit best, though, and our 5-foot-6 tester happily lasted through a 450-mile, one-day jaunt. Over interstate stretches, the 900SS settles into a soothing lop-gear cruise-mode, the engine's vibration a pleasant rumble lil-lle different in feel and intensity lo that of a Yamaha Venture Royale's. Despite its expanse, the fairing merely deflects the breeze off the chest; there's no turbulence, though, and helmets pass through clean air, Each freeway expansion joint makes itself fell through the front and rear suspension, hut unlike many ultra-sport bikes, the 900SS doesn't frequently leave you wishing you had a second, more civilized motorcycle. The 900's torquey powerplant allows you lo navigate city congestion without ever screaming the engine. W hen pulling away from stoplights, though, the dry clutch can he bothersome, screeching like a garden rake dragged across a chalkboard. The clutch on our lest hike became noisy and unpleasant early on, before any drag ship abuse; we've encountered the problem on several recent Ducatis, The local dealer said that's some Ducatis screech, some don't, and proceeded to bead-blast the clutch plates on our 900, then reinstall them among the sintered-bronze friction plates, placing them in the basket in different order. With time, the clutch quieted down, but still didn't like aggressive slipping off the line. Other glitches include the irritating, spring-loaded, German-spec kickstand (easily remedied by grinding down the stand's protruding Allen bolt). And as with every Other Ducati. the dashboard's indicator lights require infrared goggles to be seen. Worse, thanks to Iwo blown loses most of the idiot lights on our 900 blinked out. along with the turn signals and taillight. Perhaps Ducati should dial Japan again and be done with its electrical problems for good. Also, one drag strip launch proved too much for a chain-adjusting boll, twisting it like a piece of hot laffy. On the plus side, the Ducal simplifies maintenance with its quickly removable fairing pieces and a hinged fuel tank that's allows fast access to the battery and airbox. In addition, the desmo valve gear of (he two-valve Ducatis can be set in a small fraction of the time required to shim an 851 or even a five-valve Yamaha engine, for that matter. What Ducati has created is a simple, stark sport hike for the nineties. More than any other Ducati now made, the SS recalls the roots of Bologna's success and rediscovers a niche in the marketplace long empty. In the best tradition of the 1978 Super Sport, the 900SS generates impressive speed through low weight and high torque, not through big horsepower numbers and the sheer technological complexity of Japan's Star Wars fours. Perhaps the best news is this: By embracing simplicity and recycling old parts, the company has kept the SS's price to $7900, closer to its Japanese competition than any other Ducati in two decades. Yet the 900SS retains the charisma that has enthralled fans of the marquee for years, with its rumbling engine, booming exhaust note, and uniquely sculpted bodywork that could only come from Italy—dipped in just that shade of red. This is the best all-around street bike Ducati has ever built, the result of smartly considered parts matching and years of experimentation and refinement. Nearly as quick as the 851, nearly as comfortable as the 907, the 900SS is perfectly balanced between them, and lighter, more toss able and easier to ride on a gnarled stretch of twisty road. This is the superlative spoil bike that the Ducati faithful always knew was at the heart of the original Pantah, the TT2, and the Fl. It's a decade-old promise filially fulfilled, and 441 pounds of solid fun.